Since I've been gearing up for the upcoming move next month, I've been taking inventory of my kitchen toys. Sadly, I have quite a few things I've maybe used once, if not at all. One of those kitchen toys would be my Madeleine pan. I knew I had to put it to use in order to justify keeping it and I'm so glad I did! After making the following recipe, I'm definitely holding on to the pan so I can make the recipe again in the future. This is a Dorie Greenspan recipe, taken from her cookbook, Baking From My Home to Yours. The first recipe I tried came from Cook's Illustrated but sadly didn't come out. Not sure what happened since I followed it to a T... but I had much better luck with Dorie's recipe. Highly addicting, these had a delicate and buttery crumb with a touch of citrus notes. Why has it taken me this long to make Madeleines from scratch? 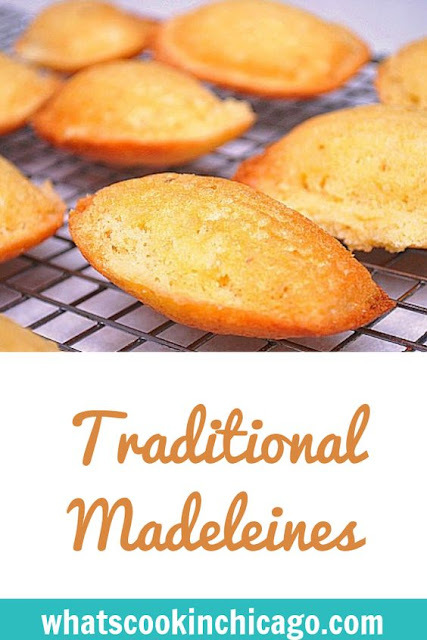 I'm now in search of other Madeleine recipes just to try more flavors. This recipe is definitely a keeper! Note: although the batter can be kept in the refrigerator for up to 2 days, the madeleines should be eaten soon after they are made. You can keep them overnight in a sealed container, but they are better on day 1. If you must store them, wrap them airtight and freeze them; they will keep for 2 months. Oh my goodness, you've just reminded me I have a Madeleine pan that my mother got me almost 2 years ago...it's still in it's packaging. Guess I better get cookin'. I lov madeleines. I have my own pan and everything. They are wonderfull. Such a pretty cookie! It looks as though this pan is going to make the cut in the move. Good luck! I love, love, love madelines! These look so tasty!! you've just reminded me I have a Madeleine pan that my mother got me almost 2 years ago...it's still in it's packaging. Guess I better get cooking'.